Shaun Tan, the award-winning author of some of the most amazing picture books, has won the biggest prize for children’s books. The Astrid Lindgren Memorial Award was set up in memory of Astrid Lindgren, the creator of Pippi Longstocking, and is awarded every year to authors, illustrators, oral storytellers and those who promote reading. It is the richest award for children’s literature, with a grand prize of close to $NZ1 million! If you’ve never read or looked at a book by Shaun Tan you don’t know what you’re missing out on. He has illustrated more than 20 books, including The Lost Thing, Rabbits, The Red Tree, The Arrival, and my favourite, Tales from Outer Suburbia. His illustrations are weird and wonderful, and he can tell an amazing story without using words. 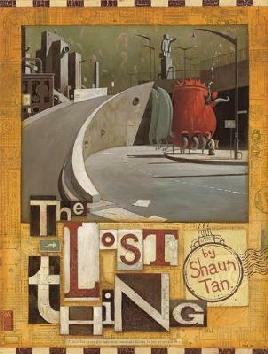 Shaun Tan has been super lucky recently because his short film of his book, The Lost Thing, won an Oscar at the Academy Awards. 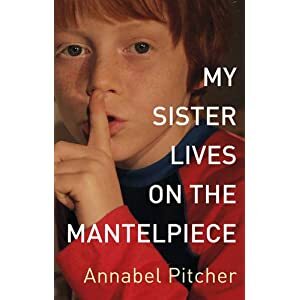 Ever since I saw the book trailer for Annabel Pitcher’s debut novel, My Sister Lives on the Mantelpiece, I couldn’t wait to get my hands on a copy. When I started reading it I knew that it was one of those special books that only comes along now and again. My Sister Lives on the Mantelpiece is about a boy called Jamie and his family, who are still trying to cope with the loss of his sister’s twin, Rose who was blown up by a terrorist bomb in London five years ago. Jamie, his dad and sister, Jas decide to move to the Lake District for a ‘fresh start.’ Jamie’s parents are still grieving – his dad has turned to drink and his mum has run off with the support worker. His sister Jasmine turns to dying her hair, piercing and stops eating. Jamie however doesn’t really remember his sister and he hasn’t cried at all. Jamie is more interested in his cat, Roger, his Superman t-shirt, and keeping his new friend Sunya a secret. Sunya is Muslim and Jamie’s dad keeps reminding him that ‘Muslim’s killed your sister,’ so he must never find out about her. Jamie’s one wish is that his mum will come back to them and he’ll wear his Superman t-shirt until the day that she does. When he sees an ad for a TV talent show, he comes up with a plan that he is sure will get his family back together again. Annabel Pitcher has created a lovable character in Jamie that everyone can relate to. Even with everything that is going in his family, Jamie holds onto the hope that he can fix things and get it back to the way it was. He has a mind of his own and stands up for what he believes is right and wrong. My Sister Lives on the Mantelpiece will make you laugh and cry and leave you smiling. It was the perfect book to read post-earthquake as it cheered me up and left me with a sense of hope. It is definitely one of my top books of the year. I’ve just started reading this and it’s absolutely fantastic! I wanted to get my hands on a copy ever since I watched this amazing book trailer.